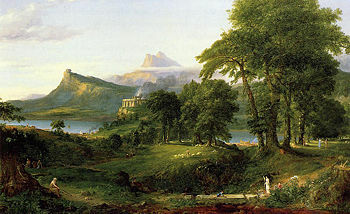 Learn about Thomas Cole and the Hudson River School. Explore the artistic, historical, and intellectual contexts behind this series of paintings, learn about Cole's techniques and influences, and consider what the story meant then and what it might mean to us now. A guide to each of the five paintings. Recommended outside resources to learn more about Thomas Cole. View the mobile version of this page. Thomas Cole (1801-1848) was an English-born American painter and founder of the Hudson River School - a group of artists in the mid-19th century known for their paintings depicting American scenery and allegorical landscapes. These artists formed an American artistic identity that was connected to, yet distinct from, the European tradition. Cole and his contemporaries were inspired by the Hudson River Valley region and the scenery they found in the Catskill Mountains; an area that was popular amongst tourists in New York for hiking and sightseeing. Paintings of scenery in this region form a large part of the output of the Hudson River School. The region where Cole lived and painted. The style and subject matter of Cole's work was derived from a tradition of historical landscape painting established in the work of 17th century European painters, such as the French Claude Lorrain and Nicolas Poussin. The historical landscape painters that paved the way for Cole's output - especially Empire. The Course of Empire is arguably Cole's magnum opus, and was his most well-known work today and in his own time. Visit this section to get an overview of the historical and intellectual currents running through this suite of paintings, then examine each of the five paintings in detail. 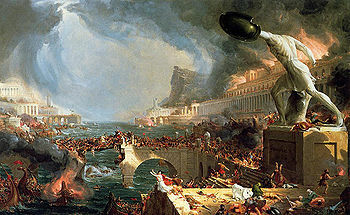 Thomas Cole's The Course of Empire (1834-36) is a series of five allegorical paintings depicting the rise and fall of a fantastical civilization. 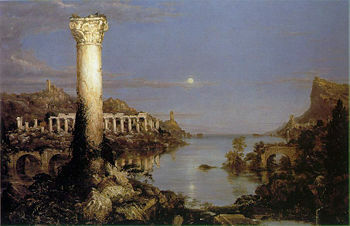 Cole envisions a prehistoric age in which nature dominates man (The Savage State); an ancient utopia in which people live in balance with nature (The Pastoral State); an era of decadence (Consummation); war and chaos (Destruction); and finally, an uninhabited world in which the ruins of mankind are once again overtaken by nature (Desolation). Scroll down to explore the contexts behind Cole's artistry and narrative, then examine each of the five paintings in detail. Thomas Cole is considered one of the first great American landscape painters, and these five paintings are a virtuosic display. His work was inextricably influenced by the Romantic ideal of the Sublime wilderness, and influences from European art. Landscape and its artistic representation was deeply important for America's national identity in the 19th century, and the fate of the wilderness had spiritual and political resonance for Cole and like-minded artists and intellectuals. The ideologies behind Cole's monumental landscapes. The historical landscape painters that paved the way for Cole's work - especially Empire. The five paintings are set at the same site during progressive times of day, each with different moods and weather conditions (the first painting depicts a tumultous cloudscape at dawn; the final painting is tranquil twilight). Cole imbues each view of this landscape with its own emotional state. How Thomas Cole told his story through the transformation of a landscape. Cole's imaginary civilization looks and acts like an ancient Greek or Roman society, from the wise philosopher sketching geometric diagrams in the dirt in The Pastoral State to the monumental statue of a discus-throwing Gladiator in Destruction. The significance of the neo-classical, Greco-Roman setting to Cole and contemporary America. Empire depicts the complete life cycle of a civilization. 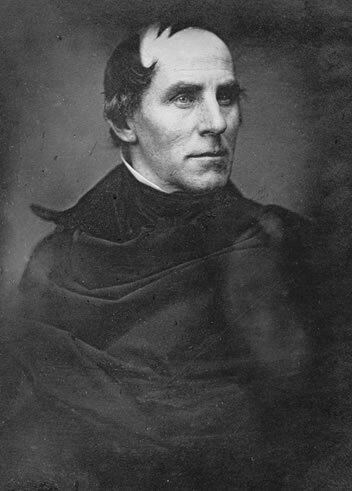 In this, Cole was influenced by cyclical theories of history well known to intellectuals in Cole's time, as well as global and national current events. The intellectual, historical, and ideological currents running through Cole's allegory and his views of human civilization. The generic Classical setting of Cole's story lends it a sense of timelessness. The paintings are a universal parable that can be applied to any civilization, and it was seen in the light of current events and trends in Cole's own time. It can be understood just as easily today. 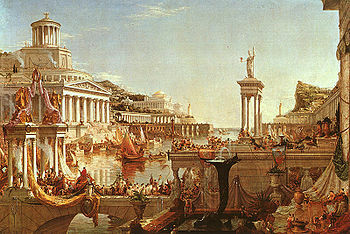 The timeless tale of Empire may be just as powerful for audiences today as it was to audiences in Thomas Cole's time. Linda S. Ferber, Vice President and Senior Art Historian at the New-York Historical Society, acts as a guide through Cole's suite of five paintings in the videos below. Click the titles to view videos about each painting. Please note that the below links will take you outside of this website. 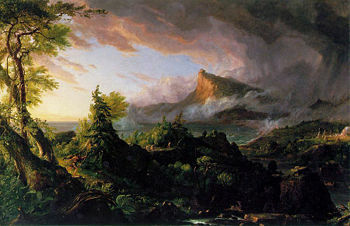 The Hudson River School: Nature and the American Vision, by Linda S. Ferber. A survey of the artists of the Hudson River School, including Cole, and with a focus on the works in the outstanding collection of the New-York Historical Society. Explore Thomas Cole. An online gallery with interactive curated guides to Cole's paintings, including The Course of Empire. The Thomas Cole National Historic Site. A guide to visiting Thomas Cole's former home in Catskill, NY, and sites in the area of interest to the Hudson River School painters.